You may have received some unfermented juice from another winery, as the fruit was not processed at your winery you must enter it as an Bulk Wine Intake rather than bringing in fruit and crushing it in your system. If you follow these instructions vintrace will report this on your 5120.17 reporting as Receiving Juice in Part IV, Row 2, Column C. vintrace assumes that all the Juice is used for wine so the juice will be reports as Used in wine Production Part IV, Row 5 and the volume will be put into fermenters (Part VII, Row 1, Column a). Once the juice is finished vintrace will report this using Part I, Section A, Row 2, which ever class column you use as per a normal fermentation. 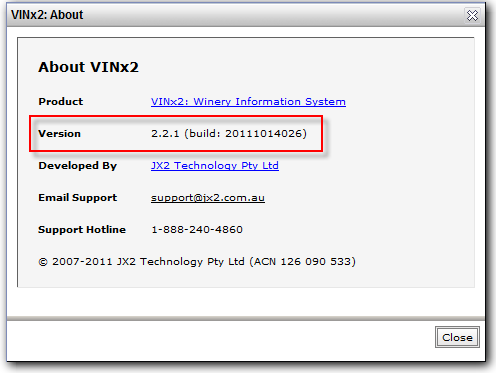 The Version is on the 2nd line if the Version number is less than 2.2.1 and the last three digits of the build number are less than 026 then please email us on support@jx2.com.au to arrange for a version update. This will result in an unfermented Juice in the tank you received it into. From here you can follow the exact same ferment workflow as you would with Juice crushed from a fruit intake. 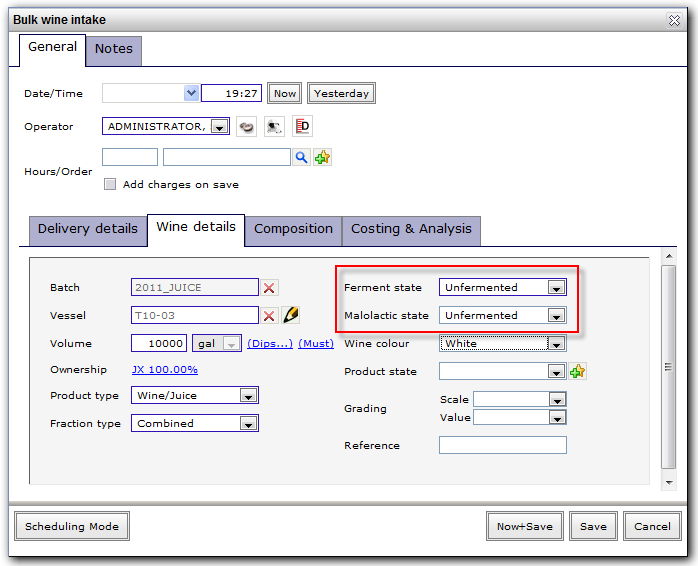 As vintrace assumes you use all this juice for wine produciton it will automatically report this as Juice Received and Used in wine production on the 5120.17 report. Please note that if you do not use all of the Juice for wine production and you wish to report this differently on you 5120.17 you must make the adjustments manually based on how much was dispatched.